Association football has been included in every Summer Olympic Games as a men's competition sport, except 1896 and 1932. Women's football was added to the official program in Atlanta 1996. Football was not included on the program at the first modern Olympic Games in 1896, as international football was in its infancy at the time. However, sources claim that an unofficial football tournament was organized during the first competition, in which an Athens XI lost to a team representing Smyrna (Izmir), then part of the Ottoman Empire. According to a source, this is an error which has been perpetuated in multiple texts. Tournaments were played at the 1900 and 1904 games and the Intercalated Games of 1906, but these were contested by various clubs and scratch teams. Although the IOC considers the 1900 and 1904 tournaments to be official Olympic events, they are not recognized by FIFA, and neither recognizes the Intercalated Games today. In 1906 teams from Great Britain, Germany, Austria, the Netherlands and France withdrew from an unofficial competition and left Denmark, Smyrna (one Armenian, two Frenchmen and eight Britons), Athens and Thessaloniki to compete. Denmark won the final against Athens 9–0. In the London Games of 1908 a proper international tournament was organised by the Football Association, featuring just six teams. The number of teams rose to eleven in 1912, when the competition was organised by the Swedish Football Association. Many of these early matches were unbalanced, as evidenced by high scoring games; two players, Sophus Nielsen in 1908 and Gottfried Fuchs in 1912, each scored ten goals in a single match. All players were amateurs, in accordance with the Olympic spirit, which meant that some countries could not send their full international team. The National Olympic Committee for Great Britain and Ireland asked the Football Association to send an English national amateur team. Some of the English members played with professional clubs, most notably Derby County's Ivan Sharpe, Bradford City F.C. Harold Walden and Chelsea's Vivian Woodward. England won the first two official tournaments convincingly, beating Denmark both times. During the 1920 final, the Czechoslovakia national football team walked from the field of play in order to raise awareness of their displeasure regarding the refereeing of John Lewis and the militarised mood within the stadium in Antwerp. In the 1924 and 1928 Olympic games, the first South American teams entered the competition: Uruguay and Argentina. Uruguay won both Olympics and FIFA became conscious that the Olympic movement was not only hindering the ability of nations to participate on an equal footing but, given that the Olympics only permitted amateurs to participate, did not represent the true strength of the international game. Following Henri Delaunay's proposal in 1929 to initiate a professional World Championship of Football, the sport was dropped from the 1932 Los Angeles Games by FIFA in an attempt to promote the new tournament. Football returned to controversy at the 1936 Berlin Games. The German organisers were intent on the return of the game to the Olympic movement since it guaranteed income into the organisation's coffers. The Italian team intimidated a referee. Peru scored a contested victory over Austria in overtime, with a fan invasion of the field at the very end. The Austrian team asked for the result to be annulled, and the game repeated. FIFA agreed, the Peruvian team refused and left the Olympics. As professionalism spread around the world, the gap in quality between the World Cup and the Olympics widened. The countries that benefited most were the Soviet Bloc countries of Eastern Europe, where top athletes were state-sponsored while retaining their status as amateurs. Between 1948 and 1980, 23 out of 28 Olympic medals were won by Eastern Europe, with only Sweden (gold in 1948 and bronze in 1952), Denmark (bronze in 1948 and silver in 1960) and Japan (bronze in 1968) breaking their dominance. For the 1984 Los Angeles Games, the IOC decided to admit professional players. FIFA still did not want the Olympics to rival the World Cup, so a compromise was struck that allowed teams from countries outside of UEFA and CONMEBOL to field their strongest sides, while restricting UEFA and CONMEBOL (the strongest confederations whose teams won every single World Cup title) countries to players who had not played in a World Cup. Since 1992 male competitors must be under 23 years old, and since 1996, players under 23 years old, with three over-23 year old players, are allowed per squad. African countries have taken particular advantage of this, with Nigeria and Cameroon winning in 1996 and 2000 respectively. Because of the unusual format, several of the historically strongest men's national teams have unimpressive Olympic records. 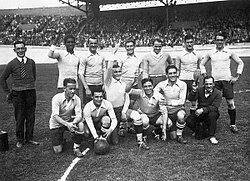 Uruguay won the tournament in their first two attempts, in 1924 and 1928, their only appearances before they qualified for the 2012 edition, after an 84-year absence. Argentina won silver twice (1928 and 1996) before the 2004 tournament, but its appearance in Athens, in which it won the first gold medal (the second was won in Beijing in 2008), was only their seventh overall (the eighth has been in 2016). Brazil's silver medals in the 1984, 1988 and 2012 editions were the best they had achieved until 2016's gold, and since professional athletes were allowed to compete, they failed to qualify in 1992 and 2004. Italy has only won the Olympic title once, in 1936, although it has also won two bronzes, and has the highest number of appearances in the tournament, at 15, with their last qualify in 2008. France has won the Olympic title only once (in 1984) and has failed to qualify since 1996. Germany's best result (before 2016 edition) was a single bronze medal, in 1988 (as West Germany), and the reunified team did not make an Olympic appearance until 2016, where they won silver. Spain has won the gold medal only once, in 1992. It has also won 2 silver medals (in 1920 and 2000) but has failed to qualify several times. The IOC approved the addition of women's association football as a permanent Olympic event in September 1993, setting an eight-team tournament for the 1996 Summer Olympics in Atlanta, Georgia, United States. The 1996 tournament, which came shortly after the inaugural FIFA Women's World Cup was organized in 1991, set a record for the largest crowd to see a women's sports event, at 76,481 during the United States–China final. The women's tournament uses the senior national teams with no age restrictions, unlike the men's tournament. Therefore, the value of the women's tournament is the same as with the Women's World Cup. Football in the United Kingdom has no single governing body, and there are separate teams for the UK's four Home Nations: England, Northern Ireland, Scotland and Wales. Only the English Football Association (FA) is affiliated to the British Olympic Association (BOA), and the FA entered "Great Britain" teams to the football tournaments until 1972. In 1974, the FA abolished the distinction between "amateur" and "professional" football, and stopped entering the Olympics. Even though FIFA has allowed professionals at the Olympics since 1984, the FA did not re-enter, as the Home Nations feared that a united British Olympic team would set a precedent that might cause FIFA to question their separate status in other FIFA competitions and on the International Football Association Board. When London was selected to host the 2012 Games, there was pressure on the English FA to exercise the host nation's automatic right to field a team. In 2009 the plan agreed by the FA with the Welsh FA, Scottish FA and Irish FA was only to field English players; however the BOA overruled this, and ultimately there were Welsh players on both squads and Scots on the women's squad. After the 2012 games, the FA decided that no team would be entered in subsequent men's tournaments, but was open to fielding a women's team again. For 2020 tournament, FIFA stated that women's UK team (not applied to men's UK team) may enter the Olympics after the four FAs agreed, depending on the performance of women's English team in 2019 FIFA Women's World Cup (which serves as the European qualification for the Olympics). Due to the number of large stadia required for the Olympic tournament, venues in distant cities – often more than 200 km (120 mi) away from the main host – are typically used for the football tournament. In an extreme example, two early-round venues for the 1984 Games were on the East Coast of the United States, well over 2,000 miles (3,200 km) from the host city of Los Angeles. The next Games held in the United States, the 1996 Games, were unique in that no matches were held in the host city of Atlanta; the nearest venue and the site of the finals was 65 miles (105 km) away on the University of Georgia campus in Athens. Counting the 2012 and 2016 Summer Olympics, there are 121 venues that have hosted Olympic football, the most of any sport. City of Coventry Stadium & St. James Park were normally called Ricoh Arena & Sports Direct Arena, but because of the IOC's rules disallowing corporate sponsorship for event sites, they were renamed for the duration of the games. Arena Fonte Nova is normally called Itaipava Arena Fonte Nova, but because of the IOC's rules disallowing corporate sponsorship for event sites, the venue was renamed for the duration of the games. For both the men's and women's tournaments, the competition consists of a round-robin group stage followed by a knockout stage. Teams are placed into groups of 4 teams, with each team playing each other team in its group once. Teams earn 3 points for a win, 1 point for a draw, and 0 points for a loss. The top two teams in each group (as well as the top two third-place finishers, in the women's tournament) advance to the knockout rounds. The knockout rounds are a single-elimination tournament consisting of quarterfinals, semifinals, and the gold and bronze medal matches. Matches consist of two halves of 45 minutes each. During the knockout rounds, if the match is tied after 90 minutes, two 15-minute halves of extra time are played (extra time is skipped in favor of immediate penalty kicks in the bronze medal match if it is played on the same day in the same stadium as the gold medal match). If the score remains tied, penalty kicks are used to determine the winner. Numbers refer to the final placing of each team at the respective Games. Numbers refer to the final placing of each team at the respective Games. Host Nation is shown in bold. The qualifying tournament, like that for the World Cup, is organised along continental lines. Most continental confederations organise a special Under-23 qualifying tournament, although the European qualifiers are drawn from the finalists of the UEFA Under-21 Championship and South American qualifiers from the South American Youth Championship, which is a U-20 tournament. Teams participating in the preliminary and final competitions must be composed of U-23 players, with a maximum of three players who are older than U-23. For Rio 2016, U-23 players are born after January 1, 1993. The women's tournament is contested between full national sides, with no age restrictions. One place is reserved for the host country. Of the remaining teams, as in World Cup contests a specific number of places are reserved for teams from each continental region; the European (UEFA) teams are chosen from the most successful European teams in the previous year's World Cup, whilst the other continental regions host their own qualifying tournaments in the build-up to the Olympics. The first women's tournament was at the 1996 Atlanta Games. The United States won the gold medal, and picked up silver in 2000 after an extra time defeat by Norway. The finals of the next two tournaments, in 2004 and 2008, also went to extra time, with the U.S. defeating Brazil both times. In 2012 the U.S. won their fourth gold medal defeating Japan 2–1 in the final. In 2016 Germany won its first gold, defeating Sweden in the final. Denmark's Sophus Nielsen in the 1908 and 1912 hold the record for the most goals scored by a player in an all and single tournament, scoring 13 goals. The first official football tournament was held in London, England, 1908. Neymar marked the fastest goal in a men's Olympic football match in history at 14 seconds in the semi-final match against Honduras on 17 August 2016. * Under-23 tournament since 1992. Below are the 41 nations that have reached at least the semi-final stage in the Summer Olympics finals. Below are the 9 nations that have reached at least the semi-final stage in the Summer Olympics finals. ※ Countries ranked by total medals won (men's and women's) including 1900 and 1904. ※ Countries ranked by total medals won including 1900 and 1904. ^ Goldblatt, David. The Ball Is Round : A Global History of Football. Penguin Books. p. 243. ISBN 978-0-14-101582-8. ^ Mallon, Bill; Widlund, Ture (1998). The 1896 Olympic Games. Results for All Competitors in All Events, with Commentary. Jefferson: McFarland. p. 118. ISBN 0-7864-0379-9. ^ "Controversia – Berlín 36. Un mito derrumbado (The Berlin '36 Controversy. A myth debunked.)" (in Spanish). Larepublica.com.pe. Archived from the original on 2009-03-22. Retrieved 2009-02-15. ^ "Women Sports Get a Boost". The New York Times. September 20, 1993. Retrieved July 15, 2017. ^ "Players". The Seattle Times. October 17, 1993. p. C2. ^ Gildea, William (August 2, 1996). "U.S. Women's Soccer Team Wins Gold". The Washington Post. p. A1. Retrieved July 15, 2017. ^ "Brown pays tribute to GB success". BBC News. 24 August 2008. Retrieved 2 May 2010. ^ "Nations pave way for 2012 GB team". BBC Sport. 2009-05-29. Retrieved 2009-05-29. ^ "London 2012 Olympics: Gareth Bale and non-English players have 'legal right' to play for Team GB". Daily Telegraph. 24 March 2011. Retrieved 28 April 2011. ^ "So much for Team GB... Powell defends nearly all-English women's football squad". Daily Mail. 26 June 2012. ^ Kelso, Paul (14 August 2012). "British Olympic Association chief executive Andy Hunt criticises Football Association for lack of support". London: Daily Telegraph. Retrieved 15 August 2012. ^ "Organising Committee takes important decisions on FIFA Women's World Cup". FIFA.com. 1 October 2018. Retrieved 20 December 2018. ^ "Tokyo 2020 Olympics: Home nations agree to GB women's football team". BBC Sport. 1 October 2018. Retrieved 20 December 2018. ^ a b The East German team represented the United Team of Germany in 1964, winning the bronze medal. ^ The team represented the United Team of Germany in 1956, and the Federal Republic of Germany (i.e., West Germany) in 1972, 1984 and 1988, and winning the bronze medal in 1988. ^ The United States had two teams at the 1904 Games, taking the silver and bronze medals. ^ The 1900 and 1904 tournaments, they are not recognized by FIFA. The competition has been held regularly, except 1932. Since 1992 compete exclusively the U23 national teams. ^ "REGULATIONS for the Olympic Football Tournaments" (PDF). ^ a b The 1900 tournament was originally a pair of demonstration matches between the three teams, but has subsequently been upgraded to official status by the IOC with medals attributed to the teams based upon the match results. ^ a b The 1904 tournament was originally a set of demonstration matches between the three teams, but has subsequently been upgraded to official status by the IOC with medals attributed to the teams based upon the round-robin results. ^ a b In 1920, Czechoslovakia abandoned the final match against Belgium after 40 minutes with the latter up 2–0. They were disqualified, and a mini-tournament to figure out the other medalists was held, with Spain beating the Netherlands for second place 3–1. ^ In 1972, the third place match between East Germany and the Soviet Union was a 2–2 tie after extra time had expired. Both teams were awarded bronze medals. Wikimedia Commons has media related to Association football at the Olympics.